Step 1 Cook the beets in lightly salted simmering water in a covered pan until tender, 30 to 60 minutes, depending on their size. Leave them to cool in their cooking water. When they are cool enough to handle, but still warm, slip them from their skins, slice or quarter if desired, and set aside. Step 2 Meanwhile, melt the butter in a saute pan over low heat. Add the blackberries and, after a few minutes, crush them with a fork. Continue to cook them until their juices run freely, about 5 minutes. Stir in the soy sauce, balsamic vinegar and basil leaves, then leave the mixture to stew over the lowest possible heat without stirring until it smells slightly smoky, about 4 to 5 minutes. Step 3At the same time, bring the milk just to the boiling point, then whisk to froth and emulsify it, preferably using an immersion blender. Step 4Turn the blackberries onto a warm serving dish and arrange the beets on top. Spoon some of the milk over the beets and drizzle the remainder over the blackberries. Add salt if desired and sprinkle with the lavender flowers. In Recipes-list.com we have selected the most viewed recipes from category - Vegetables Vegetarian . Enjoy the best recipes specially selected for you! 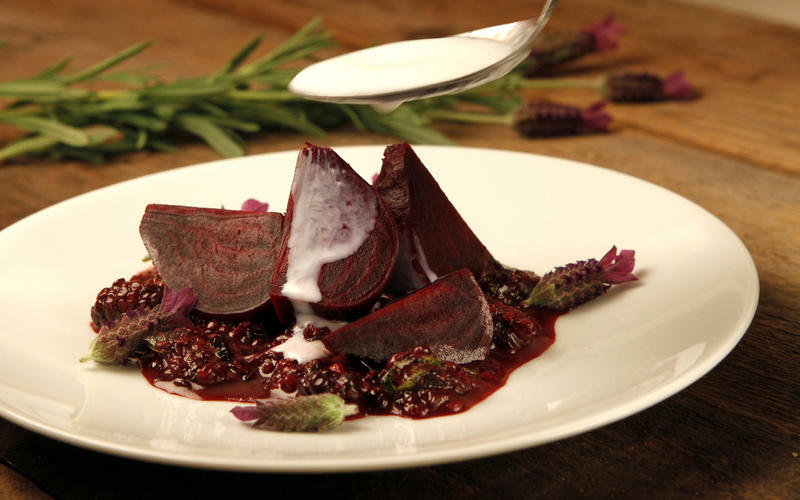 Beets with lavender and crushed blackberries is the right choice that will satisfy all your claims.